The Drager Saver PP10 is an emergency escape set which will allow you 10 minutes to safely escape from a hazardous environment where smoke and toxic fumes are present. The soft bag also comes with photoluminescent panels with reflective stripes to increase visibility and a transparent window to check the pressure of the cylinder. The bag is both flame retardant and washable and will allow water to be drained freely. 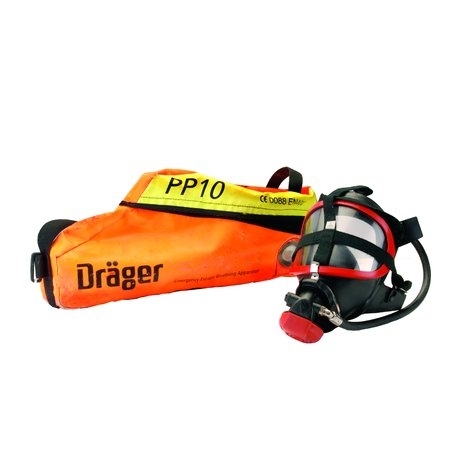 The Drager PP10 works through automatic operation and using positive-pressure. Once the escape set is opened the breathing air is automatically activated and will provide a continuous air flow until the cylinder is empty. If a false alarm occurs the unit can be reset easily and cylinders can be refilled without the need for tools.